Ever wonder why Denmark is consistently ranked the happiest country in the world? It might have something to do with hygge (pronounced hoo-gah), which sounds like a tasty stew but is actually something quite different (though simmering stew can help to produce feelings of hygge). While there is no exact equivalent to the word in English, it’s best described as the cozy, familiar feeling you get from spending time with friends and family, and creating a sense of warmth in your home, especially throughout the winter months. Hygge encourages you to celebrate the basic pleasures in life and can lead to deeper contentment, feelings of comfort, and a joyful outlook. It’s about focusing on experiences rather than possessions and good feelings instead of material wealth. You’ve heard it before, but we’ll say it again – the single best way to forge true, meaningful human connections that extend beyond the world of social media is to put down your phone and look into someone’s eyes when you’re talking to them. Try setting little goals for yourself, like no electronic devices after 6 pm, or TV-free Wednesdays. Once you experience the quiet, simple joy of electronic-free living, you might realize how little you actually miss your smartphone. No matter if it’s a book, a magazine, or a newspaper – reading expands your mind and promotes curiosity and lifelong learning. Fiction is fine, but if you really want to take this one to the next level, try learning something new with a biography or other non-fiction book. This activity is ideal for chilly days spent curled up in a comfy chair with your coziest organic loungewear and softest throw blanket. Book in hand, it’s time to light a fire in the hearth, put on some slippers, and spend a quiet afternoon at peace with yourself. As a bonus, the roaring fire can help to keep your heating costs down, since you won’t need to turn the thermostat up so high. Set the mood for relaxation with some soft lighting. Turn off overhead lights (and preserve electricity in the process) and light a few natural, unscented beeswax tea lights, or use flameless candles if you have little ones or pets in the house. The cozy glow promotes a sense of calm and peacefulness. Warm up and reclaim a little piece of your childhood with rich, dreamy hot cocoa. Put down the packet and opt for made-from-scratch instead, which you can make in a hot chocolate pot with melted chocolate bars combined with cream or milk, and then frothed up with a traditional molinillo. 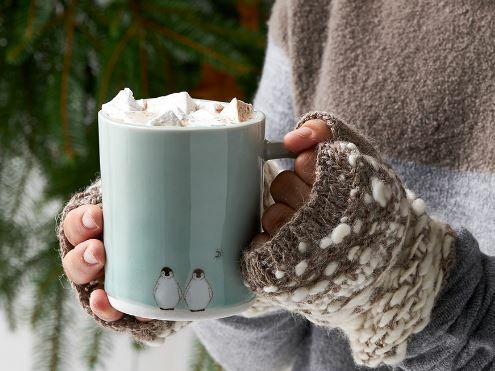 The best accompaniment to hot cocoa? Cookies, pies, and cakes. Spend an afternoon making delectable organic goodies from scratch that you can enjoy and share with your friends and neighbors. Remember to take your time and take pleasure in the joy of creating something, rather than rushing through this time-honored tradition. Plus, the delicious scent of your baking dessert will create a warm, wonderful atmosphere in the whole house. Unless you have hours to spend on research and prep, now is the time to do away with fancy recipes and focus on the basics. Gooey grilled cheeses sandwiches, well-seasoned roasted chicken, and hearty crock pot chili made from scratch are all simple, classic meals that don’t take very long to prepare. Instead of spending all your time dicing and chopping, splurge a little on the precut veggies and use those precious extra minutes to connect with your loved ones. Danish homes are filled with natural elements, such as stone walls, hardwood floors, and rustic details. Mimic this style by incorporating little bits of nature into your décor. You could decorate your mantel with pine boughs, hang up a living wreath, stack a log pile next to the fireplace, or even just add some happy potted plants to your windowsill. While many hygge principles deal with staying bundled up inside, it can also be invigorating to spend time in nature during winter months. Bundle up in a scarf and coat and go for a brisk walk around the neighborhood after dinner. Then, of course, reward yourself with a nice hot cup of cocoa when you come back inside. Friends, family, neighbors – it doesn’t matter who’s involved, as long as you’re having fun. But don’t spend hours planning a themed dinner party or scouting out reservations at the hottest restaurants…it’s the simplest gatherings that often turn out to be the most fun. Make the most of your quality time and invite the whole group over for a game night with warm caramel apple cider (with or without alcohol). Have everyone pile their cell phones into a basket and make a game of who can resist checking theirs for the longest. Then socialize and be merry all night long and let your worries melt away. That’s living the hygge life to the fullest!